Apologies for the terrible quality of photos. My wife still has our camera in Seoul, and I took these with my ancient phone camera. She's back soon, so hopefully the photos will get better. Hi guys, I wanted to post these Hong Kong reviews a little closer together, but ever since I wrote the last review (and I should probably go back and re-read that review to make sure it's coherent), I've been pretty out of it with a fever and a terrible headache. 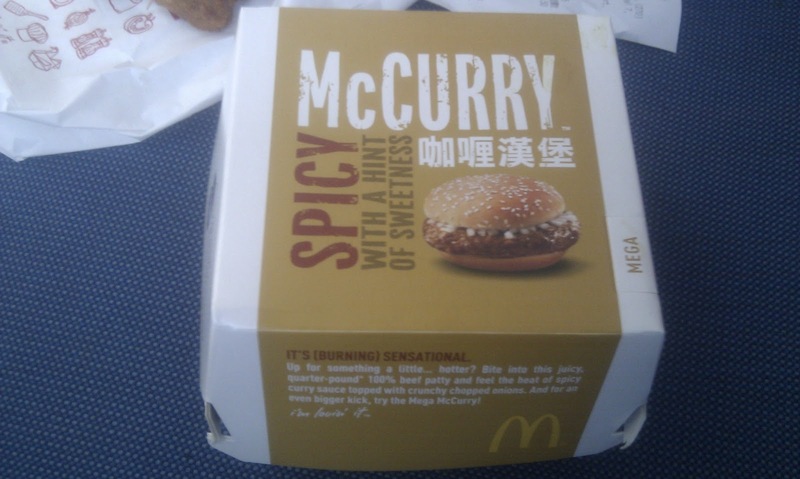 Not sure if it was a reaction to the yellow fever vaccination in Korea last week, but I'm feeling much better, and well enough to write the review for the McCurry, the 2nd "Spicy Sensations" promo item I was able to get in Hong Kong airport last week. 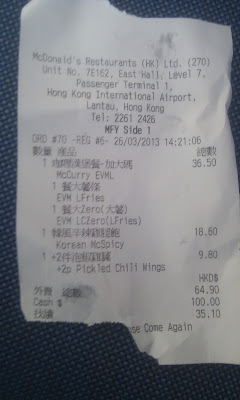 If you haven't read the review for the Pickled Chili McWings, go back and do so now, and you'll get a little background on my race to get these items in HKG. 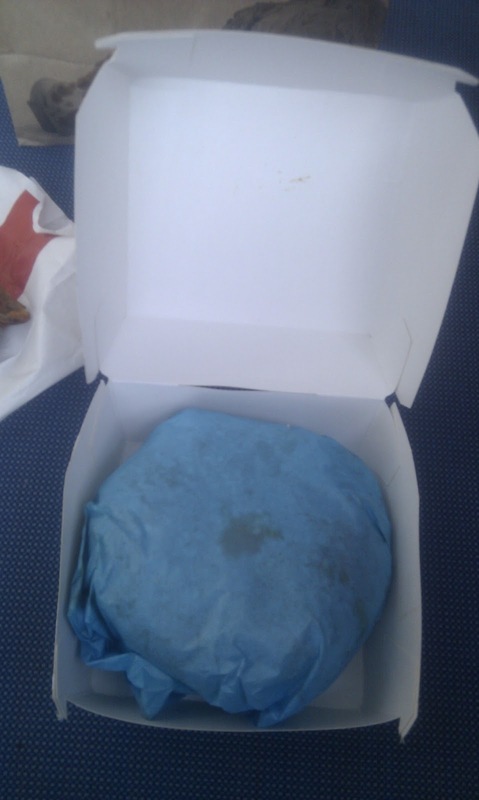 Wrapping allowed it to stay together during my long walk to the gate, for that, I was thankful. I opened up the burger immediately after finishing up the Pickled Chili McWings. I was trying to be quick, but I could see the queue to board was still pretty long, so I wasn't all that rushed. 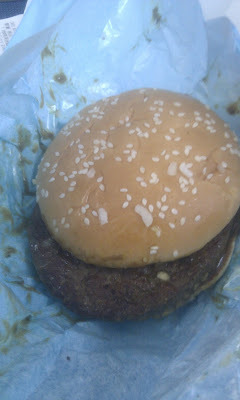 As this was the first of two burgers I would be trying, I only opted for the single patty McCurry, rather than the double patty Mega McCurry, and it was a good thing I did, the beef was thick, and though the only vegetable on it was a meagre sprinkling of onion, it still had a pretty hefty weight to it. I was also pretty impressed that the beef was actually bigger than the bun, just like the promotional photos, that isn't something that usually happens. Now, it didn't have the same orange curry colour as the photo, but I was still impressed by the curry smell coming from the burger, even though it was made 10+ minutes before I sat down to eat it. Before I arrived at McDonald's, I knew the McCurry was a burger that was available, but I never noticed the Japanese writing just under the "Spicy Sensations" on the McDonald's Hong Kong website (look at the photo at the top of the page to see what I mean). I knew the other Spicy Sensations burgers were supposed to be Korean and Japanese themed, so I assumed that the McCurry was going to be an Indian curry, rather than another Japanese. My first bite surprised me when I found out that it was indeed a Japanese curry flavour they were aiming for, it took me by surprise, but it worked out well. The curry flavour had a subtle kick when you swallowed, and you the meat though thick, was coated perfectly, that not only could you taste the curry in every bite, you could still taste the beef. 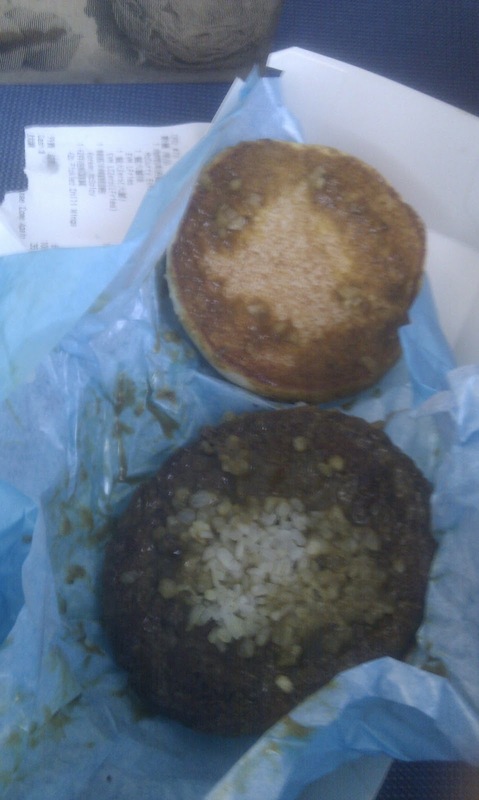 I'm glad the curry flavour had a bit of spice too it, as this was in the "Spicy Sensations" line of spicy burgers, and I'm sure lots of other countries would have just used non-spicy curry sauce.